We’re pleased to announce a gorgeous litter of 6 Goldendoodle puppies born December 21, 2018. Based on their 28 pound F1B Goldendoodle mom and 24 pound F1B Goldendoodle dad, we expect this litter of puppies to be 23-35 pounds fully grown. 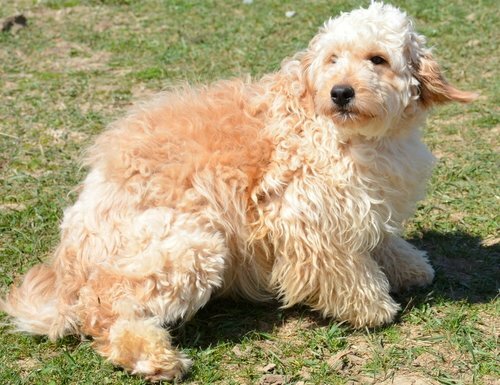 Each of these mulitgenerational mini Goldendoodle puppies has a gorgeous, curly coat that are thick and begging to be petted. We believe they will make really nice family members for a few fortunate forever homes, particularly families who want a non-shedding Goldendoodle. Chloe is a sweet Goldendoodle who is beautiful both inside and out! Her adorable, loving personality complements her gorgeous coat. Chloe plays very well with her siblings and is her happiest when we scoop her up for some love! Coral is a beautiful, loving Goldendoodle with a soft coat. She loves to be around her family and enjoys a good adventure. Coral is very smart and we believe she will be easy to train. We know that she will be a wonderful furry family member! Cassie is an adorable deep red Goldendoodle with an endearing personality. We love scooping her up for a snuggle after playing with her! Cassie is loving and very compassionate, and we know that she will make a forever home very happy! Cully is a heart melting puppy with a gorgeous curly coat. She is cheerful, loving and loyal. She embodies the best characteristics of Goldendoodles and will make a wonderful furry companion! Camo is an adorable Goldendoodle with a beautiful apricot coat. He is a mellow little fellow with a love for life! Camo loves playing with his siblings but we think his favorite spot is at our feet. Covey is a sweet little Goldendoodle with a handsome coat. He loves to play with his siblings, and is kind, gentle, and loving! Covey is a happy, tail-wagging kind of guy who loves everyone around him. He will love you immediately!